A: Arcata, California (Northern California, amongst the Redwoods). A: In 1978, I started a bass when I was apprenticing as a Cabinet and Furniture maker but I had too many things out of whack so it never made it. 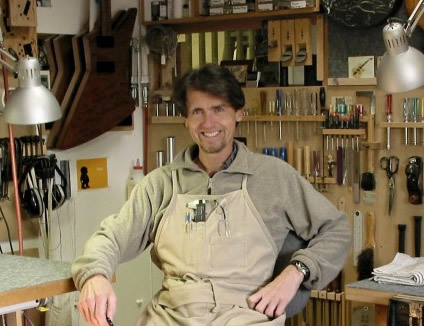 I moved to California in 1980 and in 1981, started working at Moonstone Guitars. It was there that I built my first bass and later, in that shop, I started my own business. A: Approximately 400 (basses and guitars). A: 18 (basses and guitars). A: Yes, fretless and fretted bass (42 years experience – professionally and semi-professionally). A: I think, after a player has developed and had a chance to experience some other instruments and feels limitations in what he/she has experienced so far, then that may be the time to consider a custom build. If that person can try one by the builder they are considering, that would be the best scenario but advise from a trusted player can be valuable as well. Q: What should players know about your basses? What sets your basses apart from the other builders? A: What I have striven for and what I hear as feedback from player of my instruments are that they feel and sound like “player’s” instruments. I feel that my experience as a (I like to think: very discerning) player has helped me to develop my instruments to a degree that I feel would be difficult if I were not a player. Sound, response, ergonomics, balance (both sonically and physically), feel….. all these are very, very important to me and factors I have worked for years to satisfy the player in myself. The artist in myself is responsible for the beauty of the designs of which I am very proud. A: I feel I have created an identity and reputation of integrity with my basses that I hope to continue to evolve and grow. My work is the result of a true (and somewhat obsessive), “labor of love” and I am truly proud to share it with other players.